Greetings to ever one in western Illinois and all readers of The Quill. I'm hope'n ever one enjoyed the annual Nigerian goat show at the fairgrounds, over the weekend and that this column finds ever one refreshed with the recent rains we were blessed with. Some areas received more rain than others, as oft times happens, but all areas had a good drink. The crops sure seem to be a popp'n now. Those fellers in Nebraska that had baseball sized hail were shore on the unlucky side of that storm. Several thousand cars were badly damaged. 80 mile per hour winds, came along with the peel'n affects of those large hail stones with siding be'n stripped right off of homes. We need to remember those folk in our prayers. In years past, we would be cultivate'n corn early in the mornings, this time of year, and hay'n in the afternoon. Of course, we would have checked with our neighbors in the hay'n crew to make sure we didn't have hay down, in conflict with one of our labor partners. There was a lot of team work in those days. Them were the days of neighbors work'n together and big good lunches ta go along with the work. Somehow it seems, even though we did not have a lot of labor save'n machinery back then, life seemed more casual. For those fellers with hay to harvest this year it seems the alfalfa weevils are posing a threat. The extreme cold weather last winter held off on the ornery bugs normal egg lay'n routine during the winter. Those eggs then have a high mortality rate by spring time. It seems those bugs can't read the book which sez below-zero weather kills over wintering adults. They just dug deeper into ground litter and hibernated. That winter brood is out now, laying eggs, which have high survival rates. Winter-laid eggs, on the other hand, often die before they can hatch in the spring but spring laid eggs hatch out fer damage in May and June, just in time ta work over new growth hay. Haying allows weevils to concentrate on regrowth from the alfalfa stubble after the first cutt'n. The worms nip new leaves as they emerge. Spraying with chemicals and 20 gallons of water carrier per acre will probably be needed after the first cutt'n for weevil control. Lower rates of water carrier may not give satisfactory control. Years ago we never worried about alfalfa weevil or spray'n fer them buggers. As I say, life seemed more casual back then. Last weeks column mentioned buttons with a poem fer the women folk or fer that matter, anyone ever connected with sewing on buttons. Well, this week I'm a go'n back in time to address shave'n. A high percentage of men are clean shaven these days. The last century produced "the era of shaving" to meet the social desire ta groom men ta meet expectations of others. In rural America the obstacle to daily clean shaving was the think'n that groom'n supplies were luxuries and/or fer wimps, sissies, and not real hard worken men. Not many wanted to be suspect of fitt'n in any of those categories. 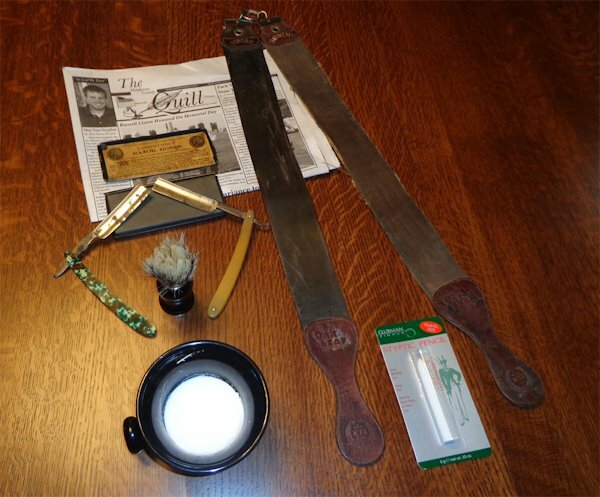 The mass produced blade and holder were invented in 1880 which provided a degree of safety over the straight razor, which could be a little dangerous, both in a good street fight and when shave'n around one's neck. There is yet one barber in Monmouth that will give ya a shave with the straight razor, if'n ya so pleases. Kinda fun fer a change of pace. Most farmers 100 years ago or so could live comfortably in their own skin, whether it was dirty or hairy. Saturday is when they would clean up along with the rest of the family members. All would use the same water in the same tub. Does any of you older folk remember those days? I sure can! The men would get out their Gillette double edged safety razor and one blade they possessed. That was all they felt they could afford. Use'n a cup with a cake of soap in the bottom, they would stir with and mix hot water and apply the lather with a bristled brush, ear to ear. There was no comparable feel'n like it, at the time. Even today it is a ritual many are return'n to. The blade was honed by mashing down on the middle and sliding it around the inner circumference of a particular glass saved fer that purpose. There was no abrasive in the glass, but it seemed to enable the blade to cut efficiently up to a week's stubble from the face. The face, with usually a spot or two of blood, was rinsed and wiped clean. The blade was washed and rinsed with clean water and put securely back in it's proper place until needed next weekend. Before the safety razor, the straight razor was the weapon of choice, against the beard, through most of the 19th century. The best and safest way fer a shave with the straight razor was fer a barber to give it ta ya. It also allowed fer a trip to town with the Mrs. fer some socialize'n, shopp'n fer needed supplies, and catch'n up on a week's worth of news. Early barbers offered services of dental work and hair cuts as their major line of work. Some did other medical services, as well as undertaker work. Most younger folk, it seems, got their ears lowered by their mothers utilize'n a bowl. Barbers followed a fairly regular routine first they would make up lather and coat the beard. Then apply a hot towel and wait fer the hair ta soften and stand up so it'll cut easier. Then ya folds out the razor, with a little indention fer yer little finger ta fit, so's ya has good control of the blade. Then carve away and don't slip! Brave men, those out in the wilderness, at war, or stone cold broke did this operation themselves, ya can probably see why they often didn't shave ever day. The barber also offered the advantage of apply'n sweet smell'n stuff to your face and neck after the operation was over. Well, as fer me and the boys, we still has us a straight razor or two from days of old. I guess we're not as casual as them fellers years ago, fer we use a safety razor daily, unless we go on a hunt'n or fish'n trip or some such thing as that. You young pups should give some of them old shaven techniques a try. Ya never know how ya might brighten up your morn'n or "Saturday night clean up!" Buttons, shaven, and casual, can ya see how it all ties together? Thats it agin fer this week, Hope'n to see ya in church this week. Visit friends and neighbors and especially those in homes fer assisted live'n and in the hospital. Wherever ya is, what ever ya be do'n BE A GOOD ONE!! !